Airplane food has been, since the dawn of time, literally a joke. Perhaps it just goes against nature that anything of culinary value could come from a tiny range-free kitchen 36,000ft in the sky. And yet, here I am, waiting to board a red-eye to Milan at JFK, trying my best to ignore the rumbling in my stomach that beckons me to Shake Shack or Panda Express. No, I must be strong; I will hold out for the in-flight meal, as counterintuitive as it may be. Lower your tray tables and prepare to feast -- tasteless, texture-free piles of mush served in plastic trays are quickly becoming a thing of the past. Dim sum carts on Singapore Airlines are a favorite of acclaimed chef Ken Oringer. Morning passengers on United get a warm stroopwafel with their Illy coffee. However bizarre, airplane food is suddenly something you want to eat. Don’t believe me? Book your next trip with one of these airlines and taste for yourself. Even as airlines badger you with obnoxious new fees (paying for overhead bin space? Seriously? ), many are striving to earn customers’ loyalty with tray-table meals that are not only perfectly edible, but perfectly delicious. Delta, for example, caused a buzz in 2014 when it started offering regional craft brews on its in-flight beverage menu, a sign of things to come. Book a Delta One flight out of JFK (that's Delta’s first- and business-class hybrid, specifically for transcontinental flights), and you'll be served meals by culinary superstar Danny Meyer's Union Square Hospitality Group -- the food service behind Shake Shack and NYC restaurants like Gramercy Tavern. Or fly Delta One from South America, and you'll get a menu created by Michelle Bernstein, a James Beard Best Chef nominee acclaimed for her Latin-style fare. Meanwhile, in Delta's economy class, passengers sip on unlimited Starbucks coffee and enjoy America's only GMO-free airline snack box for an extra charge. Not too shabby. 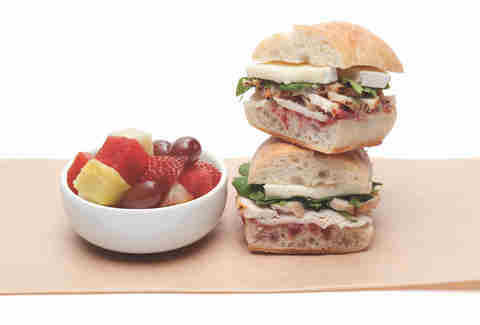 JetBlue is the snacker's go-to when flying economy. On domestic and international flights, passengers are treated to an endless pantry of complimentary name-brand snacks, including Cheez-Its, Craisins, and popchips. If free snacks don't wow you, the in-flight meal up in first class (aka JetBlue Mint) will. JetBlue is yet another airline partnering with renowned chefs and pursuing advanced technologies that deliver better moisture in aircraft ovens and a greater understanding of taste and texture at higher altitudes. 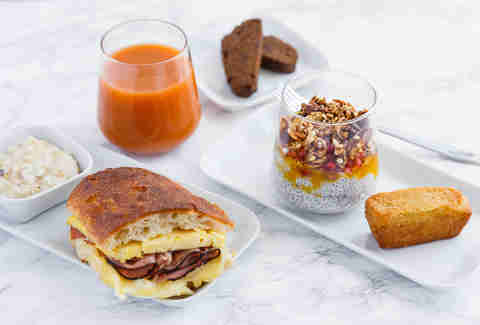 JetBlue partnered with chef Brad Farmerie, of New York’s Saxon + Parole, to create the first-class menu. He found that your taste buds are dulled by up to 30% when flying, which can account for why airplane food traditionally tastes so bland. Instead of amping up the salt, Farmerie uses fresh herbs, vinegar, and spices -- all measured by scale, rather than measuring spoon, for precision. Along with using local ingredients in regional flight dishes, Farmerie trained cooks to sous-vide airplane meals so they are partially cooked, eliminating a few steps in airplane prep kitchens, which don't have running water or refrigerators. The airline stores its meals and perishables on dry ice, so the sous-vide technique keeps food moist and tender when it's being reheated in-flight. 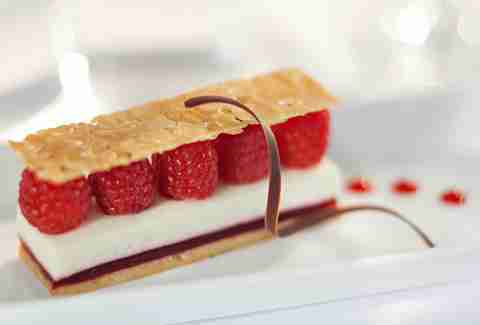 Emirates is investing to become the airline of choice for international flyers who want to eat well in the air. So far it seems to be working. Chef Jamie Bissonnette, the man behind Boston's Toro and Coppa, told us his best in-flight meal ever was on Emirates. "Labneh bil na'na, fool, hummus, murgh do pyaaza (chicken curry), and breakfast," he said. "It was all so tasty." That was leagues beyond his worst-ever in-flight meal, on Philippine Airlines. "Meat of no specific origin with mushy, flavorless rice," he said. "I'm not sure what was in the food, but can be sure it was animal flesh, overcooked rice, and too much salt. Inedible!" 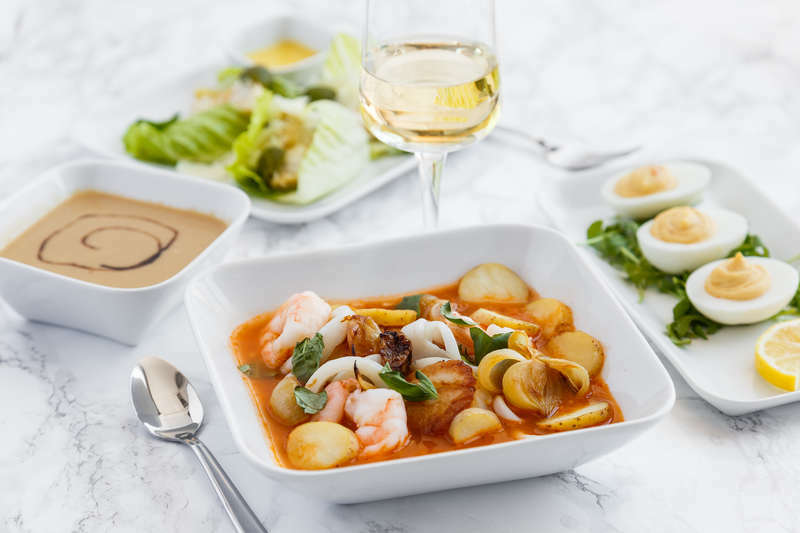 “There is a lot more culinary awareness amongst our customers, and a lot less tolerance for what was commonly known as 'airline food,'" said Joost Heymeijer, Emirates' senior vice president of catering. 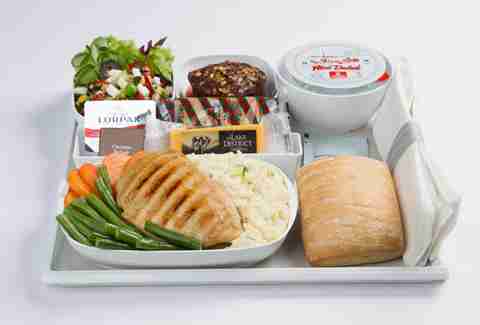 "People [now] expect restaurant-quality food, even on an aircraft." The food on Emirates varies regionally. For example, meals to and from Japan are served with authentic Japanese crockery, cutlery, and a tea set. Flights to Italy serve pasta dishes like gnocchi and ravioli. The idea is that your trip begins as soon as you board the plane -- not the second you step off. And while sitting in economy isn't going to get you a first class-style complimentary pour of Dom Perignon, Heymeijer told me that Emirates' economy-class menus are designed and prepared with the same attention given to the more expensive seats. You'll receive dishes that sound suited for high-roller passengers -- like braised beef with horseradish served with mashed potatoes, sautéed spinach, and carrots, or chicken with creamy mushroom sauce, gnocchi, and green beans. Between meals, passengers get slices of pizza, ice cream, chocolates, and fruit. It's basically a party in the sky, with your own individual on-demand TV screen. While efficiency, price, and comfort (ugh, skinny middle seats) may be your top priorities when you book a flight, airlines want to put hospitality top of mind with the hope that passengers will intentionally board hungry. You wouldn’t necessarily make a restaurant reservation just because the food is cheaper, or there's an earlier time slot available. Eventually, in the same vein, you may not book a flight based solely on schedule and price, but for the quality of experience -- and the eats. Sorry, Bourdain, but if we’re bored in-flight, we’ll download a podcast. That tray table is there for a reason, and airlines are finally living up to its potential. Melissa Kravitz is a writer based in NYC who has always loved airplane food. Follow her plastic tray adventures @melissabethk.